In September 1683, the Polish King Jan Sobieski swept down from the heights of Kahlenburg and beat the Turks from the Gates of Vienna. It was a nail in the coffin for Ottoman designs on Central Europe, and a mighty close call for the Habsburg capital. The grateful Viennese gave the Polish King a hero's welcome, and Sobieski was showered with presents by princes from across Europe. But the solidarity was not to last. 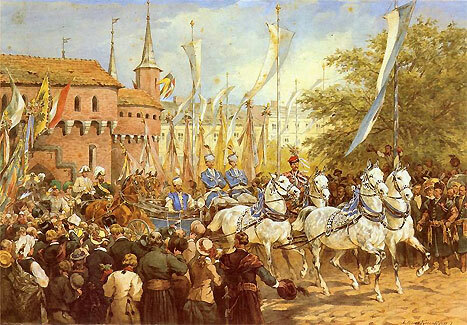 Above: Emperor Franz Joseph enters Krakow in 1880. Following the partition of 1772, Austria's Polish gains became the province of Galicia, with Lemberg (formerly Lwow) as its capital. Although Krakow managed to cling on to its freedom for a little longer, the Habsburg border now came all the way up to the southern bank of the Vistula, where the Austrians immediately built the town of Podgorze as an economic rival to Krakow. The remainder of the city was finally gobbled up in 1795, only to be liberated by Prince Jozef Poniatowski in 1809. The Prince was fighting for Napoleon, yet even after Bonaparte's defeat in 1815, the Allies awarded Krakow 'Free City' status. But this all came to an end after a Polish Uprising in 1846, and two years later the Austrians were firing cannons on the Old Town from the former Royal Castle of Wawel. By this stage, the Austrian Empire had barely 60 years left to run. And after such bloody beginnings, the Polish arrangement looked set to be a grim one until the bitter end. So how did it come about that the Poles became amongst Austria's 'most loyal subjects'? Why is it, that the image of Austrian Emperor Franz Joseph (1848-1916) endures as one of the most trusty emblems that you'll find in Cracow, adorning restaurant signs, water bottles and countless nic-nacs? The mutton-chop whiskered monarch is as safe a choice for a shop-sign as Churchill would be in England. He's the grand old teddy bear. (Suffice it to say that not in a million years would a Russian Tsar or a Prussian king be put forward as a cherished Polish symbol!). The reality was that after 1870, the Austrians ran a much more lax ship than the Russians or the Prussians. As the Habsburg vessel began to wobble in the 1860's, Vienna decided to try and win the loyalty of her subjects by awarding far-reaching autonomy. The Hungarians and the Poles were amongst the main beneficiaries, and Krakow was poised for a major renaissance. With this new-found freedom, Cracovians began cultivating the city's patriotic heritage. Enter the Czartoryski Museum, the Cloth Hall Gallery, the Hutten-Czapski Museum and many other such institutions that would previously have been impossible. Statues were erected to Polish heroes - unthinkable in Russian Warsaw - and there was an explosion in the arts, especially in painting. The icing on the cake was the return of the Royal Castle to Polish hands. (When the Austrians had first moved in they had grazed horses in the royal chambers). The city was cleaned up, buildings restored, and the Austrian fortifications began to be viewed as protective rather than imprisoning. That said, Galicia was no land of milk and honey. The countryside was backward, and the Austrians drained resources for much of the nineteenth century. Yet Krakow, Lemberg and other cities were on the up come 1900. Austrian and Polish families inter-married, and even a branch of the Habsburgs became proud Polish patriots. There are many places in Krakow where the spirit of the Habsburg Empire still reigns. The traveller can find relics of both the ugly side of Austrian rule and the later, more harmonious epoch. Galicia-born writer Joseph Roth wrote much of officer life in the Imperial Army, and the latter half of Rakowicka Street is like a little piece of the Empire preserved in aspic. Here, as you approach the old cemetery, you'll pass a string of former Imperial army edifices. You're already a fair stroll beyond the Old Town centre now, but the walk is more than worth it as the cemetery itself ranks amongst Europe's most magical (coincidentally, the graveyard was founded by the Austrians in order to distance burials from the Old Town). Back on the fringe of the Old Town, Plac Matejko is adorned by two grand imperial buildings, the Academy of Fine Arts (No. 13) and the State Railway Headquarters (No.12). Both continue to follow their original functions, albeit now under purely Polish rule! Heading west from Plac Matejko, one finds numerous streets that typify Austrian Galicia. Streets such as Kremerowska, Siemiradzkiego and Michalowskiego were sought after addresses for well-to-do Krakovians. Tiled porches and elegant wrought iron-staircases survive in abundance. (Incidentally, the architects of these buildings were almost exclusively Polish). Within the Old Town itself, the Jama Michalika and Noworolski cafes have preserved their fin-de-siecle interiors, as has the magnificent Slowacki Theatre. Less sentimental relics of Galicia are also to be found. The most ugly of all can be found on Wawel Hill itself. The Royal castle was initially turned into a barracks and many nearby buildings were razed to the ground. The vast red-brick building that stands opposite the castle was built by the Austrians as a military hospital. The military presence is also evidenced in the sophisticated chain of forts that ringed the city. These are now considered invaluable examples of their kind. Two representational examples are to be found by Krakow's legendary memorial mounds. The Kosciuszko Mound, west of the Old Town, was hijacked by the Austrians and heavily fortified. And to the south of Krakow, above Podgorze (a charismatic district that was itself created by the Austrians after the first partition of Poland) the red-brick fort No.31 is worth a look. It's very close to the pagan burial mound of Prince Krak. From here, one can savour a fantastic view over the city. My great grandfather was Albert George Stetts or Stece, (son of Stephen S and Mary Clossick (sp.?). The Stetts or Stece name replaced a much longer name upon arrival in US). It didn't even resemble the aforementioned, according to my grandfather, who told me what it was. Noone in our family knows this name. I had such disgust with this thoughtless change, that I didn't write it down, which I tremendously regret. The family is said to have come from Austria/Poland area somewhere between Krakow and Vienna in 1883, spoke Polish, (family were beekeepers and had fruit orchards near the Polish border), From the cream of the light cavalry, Emperor Franz Josef chose him for his special unit of horse soldiers. He served in this capacity for four years, a Captain's orderly stationed at the palace gate in Vienna. He performed before royalty and court blue-bloods, it's reported. He was an excellent horseman. I am the only one in our family, still living - grandfather had nine siblings - who has heard our name. I want to find it! An idea? Very biased anti Austrian article. The Habsburg branch mentioned in this article are archdukes from Galician town of Żywiec, last duchess lived in Żywiec castle until her death a couple of years ago. I was very interested in your article, in particular, because it mentions an arm of the Habsburgs who became proud Polish patriots. This group you refer to, did they change their name from Habsburg to Burgiel? Growing up, I was told that my family were Habsburgs but they changed their name to Burgeil and they were from a village outside of Krakow. I have been trying to verify that story for years and your phrase in the article is as close to that as I have come. Any thoughts would be greatly appreciated. My grandparents listed Iskanco Austria as their last residence however I cannot locate any records of this town in Austria or Poland . Any suggestions in locating old town names ? Krakow is a large town with a small town flavor. It was called the pearl of southern Poland. Before you visit Warsaw, Prague, Vienna or Paris, you must see Krakow. Read the story about Krakow and Poland in general,events since the Mongol invasion to second world war,James Michener "Poland", a good read highly recommended for all Polish people. 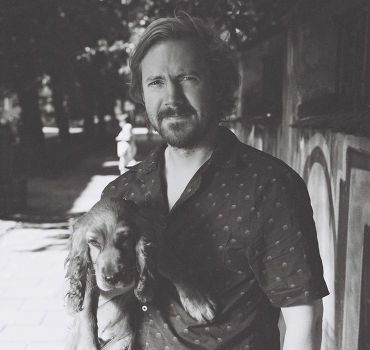 I find Poland could have been such a beautifully successful country if not for the selfish attitudes of the upper-class, who did not want to share their wealth with fellow polish,thus sustainance of their country. My father was born in March 1892 in the village of Zayanse, Austria. During this transition 1918; the partician of Poland, I was told that many villages names were changed. I was told this by a Polish priest In Posen, Michigan. Is there any way thru court records, census's to find out what the village of Zayanse which is now in Poland was changed to ?